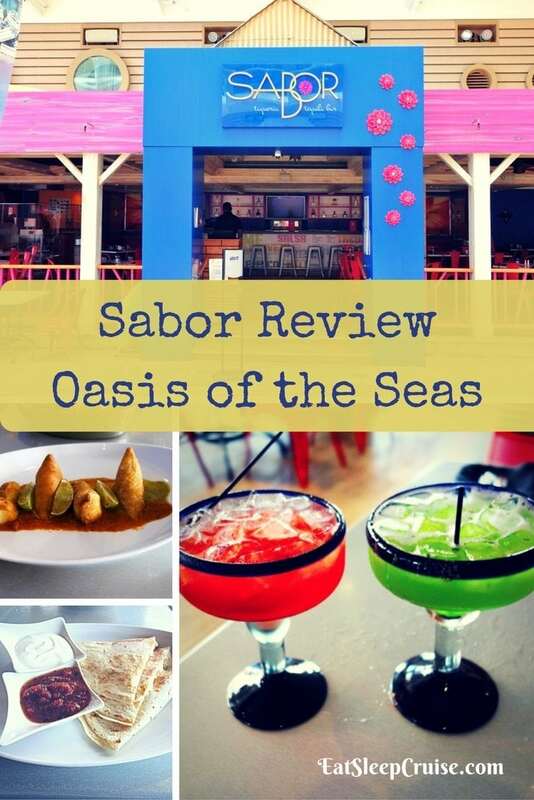 After booking our Oasis of the Seas cruise, there was one thing that the Princess and I decided immediately- that we would have to dine at Sabor for research purposes of course. 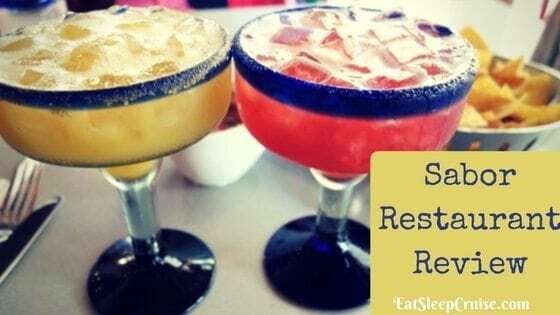 After hearing and seeing some of the delicious reviews out there, we were highly anticipating sampling the food and drinks at this specialty restaurant. 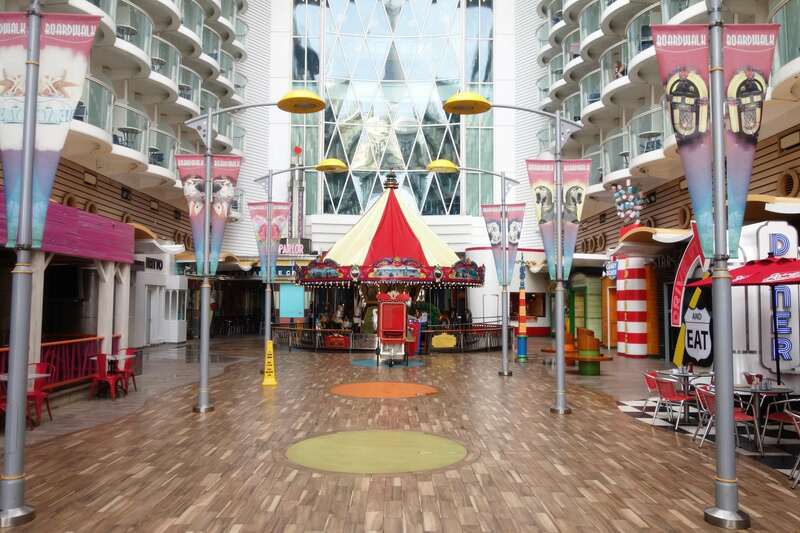 Now armed with experience, we bring you our Sabor Oasis of the Seas review. 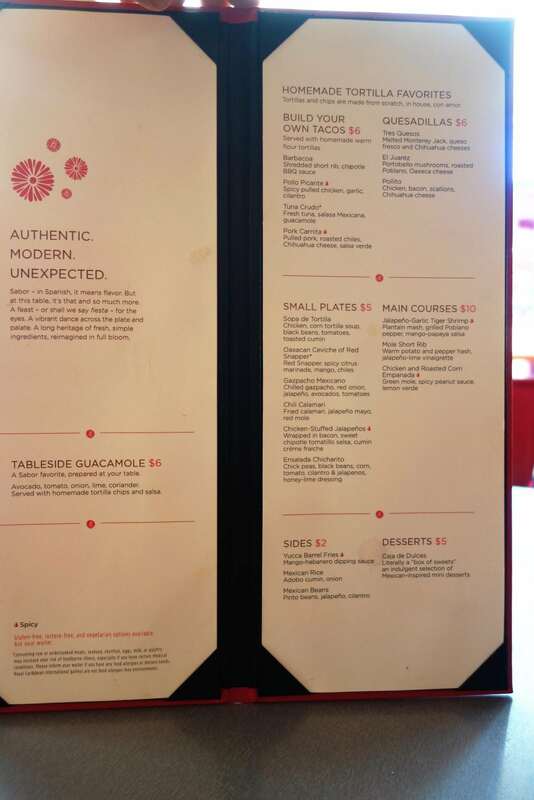 Since Sabor on Oasis of the Seas is a la carte pricing, we decided that we would just grab lunch or snacks here instead of making a dinner reservation prior to the cruise. After one lunch experience, we found ourselves returning for a second round later in the cruise. One visit just wasn’t enough to give the menu a full test run. 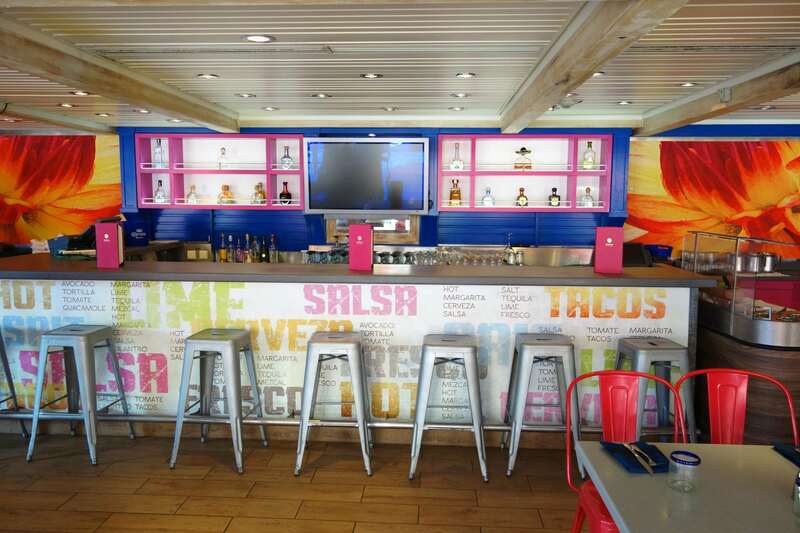 On Oasis of the Seas, Sabor restaurant is located on deck 6 in the Boardwalk. It is all the way aft of the ship, port-side, right before the Aqua Theater. This prime location makes for some great people watching while enjoying your food and drinks. On most sea days, Sabor was open from 11:30am to 11:30pm. On port days, the restaurant usually opened around 2pm or 3pm, making it the perfect place for a late day snack after returning to the ship. In the compass, it stated that “Dinner” was from 5:30pm to 11:30pm, but according to the staff, the menu stays the same all day. Although you can make reservations ahead of time using the Cruise Planner, the restaurant never seemed all that busy, so a reservation is probably not necessary. 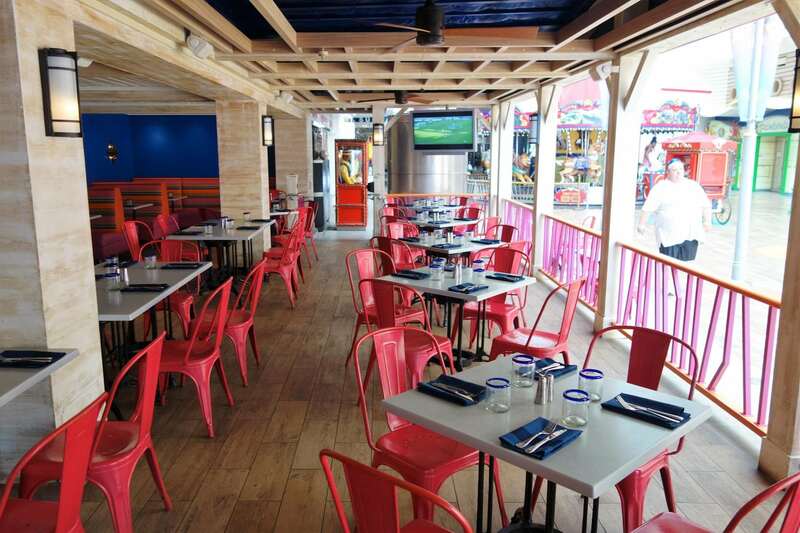 There is a bar inside the restaurant, not to be confused with the Sabor Bar in the middle of the Boardwalk. The bar inside Sabor restaurant serves signature margaritas and specialty drinks. The kiosk style bar outside does not. Even if you do not want to dine at this venue, we suggest you hang out at the bar for a little while. 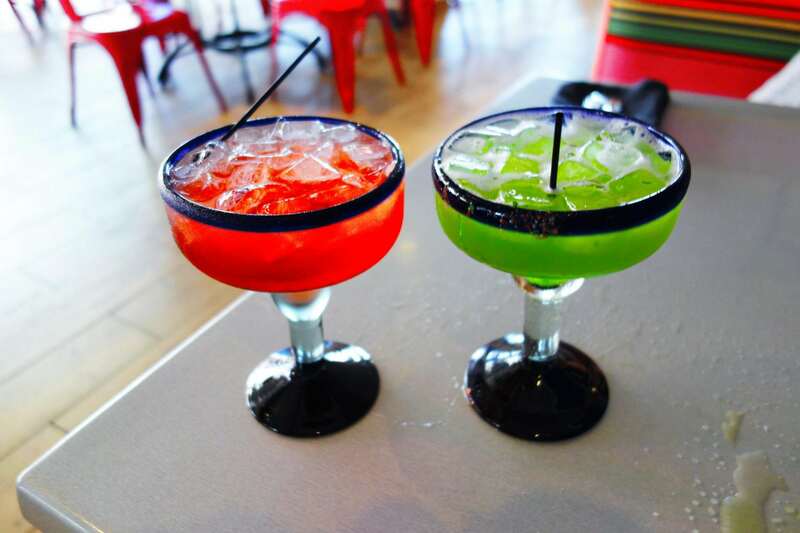 This is the only location you can get these hand crafted margaritas, which are covered in the drink package! This Sabor location is an open-air restaurant, so you get the feeling of dining outdoors but with protection from the elements. One downfall is that the dining area is not air conditioned, so you will not escape the heat. The decor inside Sabor is bright and colorful and very casual. There are certainly no worries about dress code here! We ate here twice during the day with t-shirts and shorts and did not feel out of place. Even though we did not dine here at night, we suspect the vibe is equally as relaxed when the sun goes down. 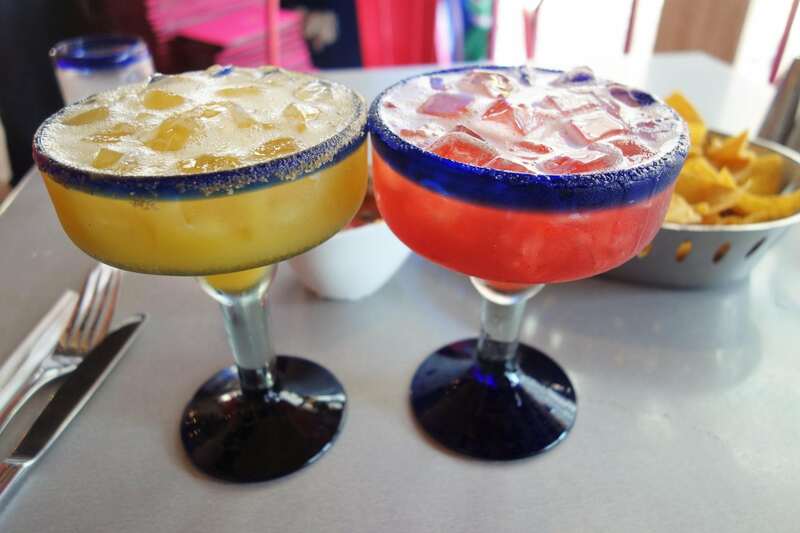 Okay, so even if you have no desire to dine here, you do need to sample the drinks as they were the best margaritas at sea. All of the signature margaritas are made from scratch and are a refreshingly light cocktail. After ordering a margarita at the Sabor bar outside earlier in the cruise, I could immediately taste the difference in quality. Tequila flights are also available, but they are not included in the drink package. Most of the other premium sipping Tequilas and regional beers are included. During our two visits to Sabor, we sampled some of the various handcrafted margaritas. 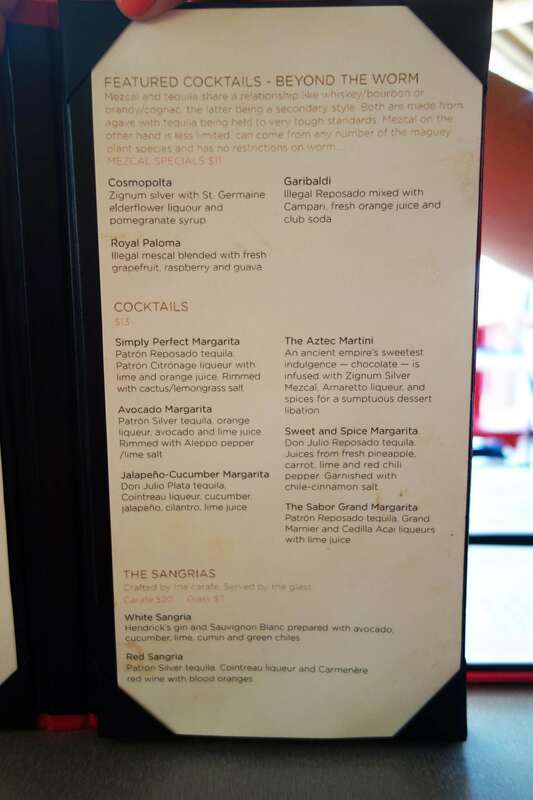 During our first dining experience, on day 3 of the cruise, the Princess ordered the Sabor Grand margarita, and I did the Simply Perfect margarita. How could we go wrong with either of these selections? The grand margarita was sweeter, which the Princess enjoyed, but I preferred the balance in the simply perfect. Both cocktails were worthy of another round, but given that we had spent a long day in the sun at Labadee, we refrained from a second dose. During our second visit to Sabor, on day 6 of the cruise, the Princess returned for her second dose of the Sabor Grand margarita. Changing up flavors, I ordered the Jalapeno-Cucumber margarita this time. It was an amazing pairing with a slightly spicy flavor and dangerously easy to sip. These cocktails were the perfect ending to a fun-filled day in Cozumel, Mexico! The food at Sabor is priced a la carte, though very reasonable, with selections ranging from $5 to $10. 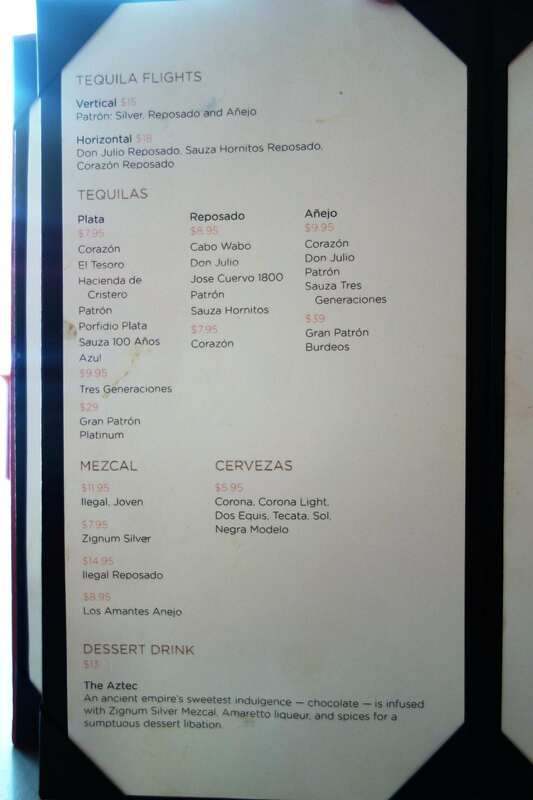 This Sabor Oasis of the Seas Menu displays all of the tasty options. 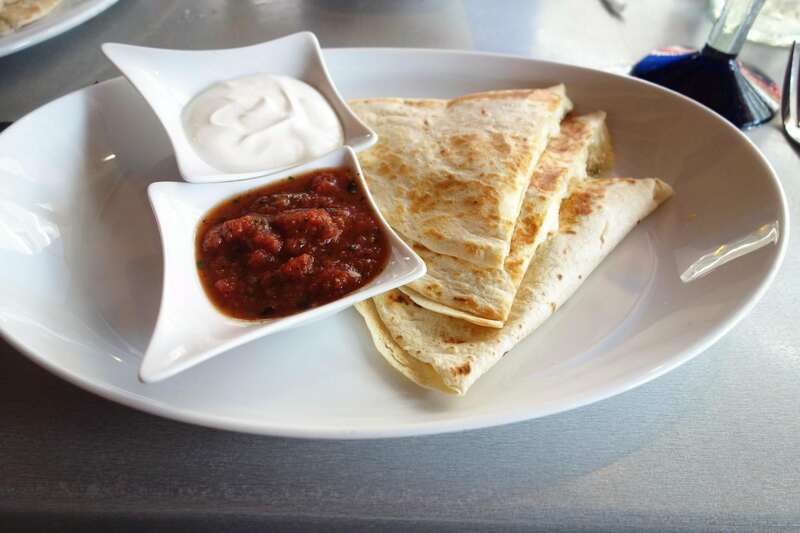 With several small plates for $5, build your own tacos for $6, and entrees for $10, there are plenty of great food choices depending on how hungry you are. 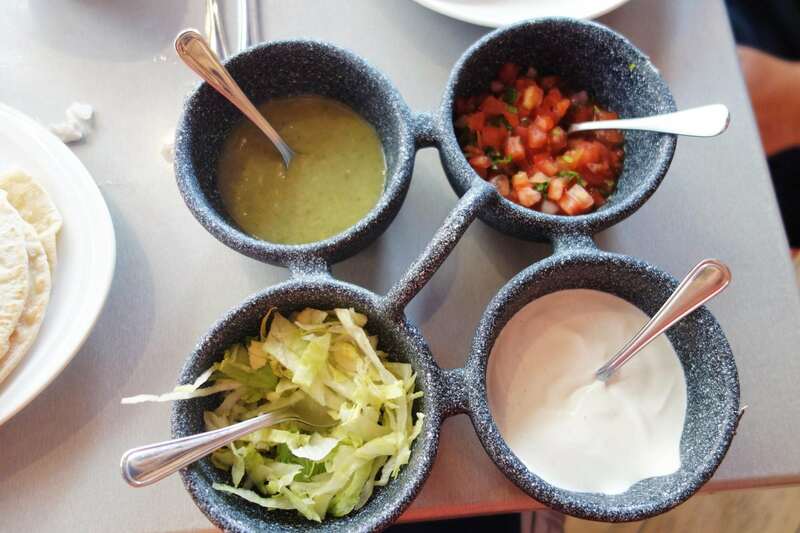 You can’t dine at Sabor and not start off with the chips and salsa. These complimentary chips are made in house each day and are leaps and bounds above the “nachos” you can find in the buffet. 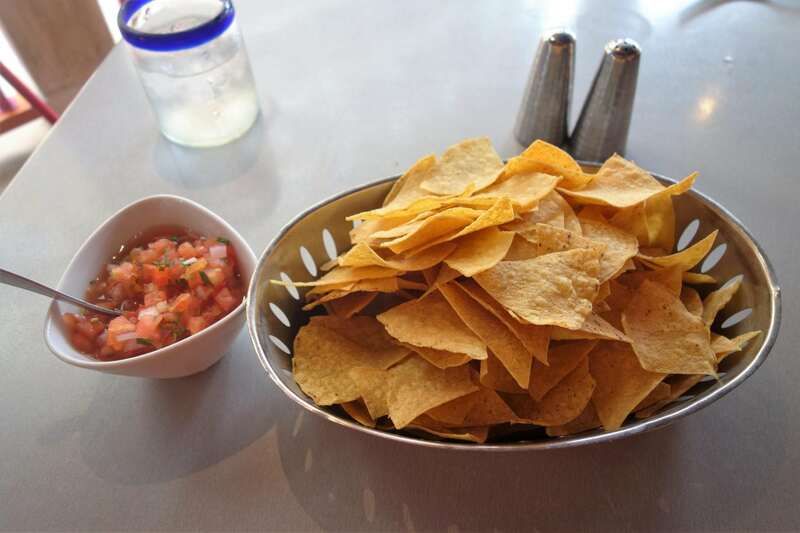 The saltiness and crunchiness of these chips paired perfectly with the fresh and mild salsa. If you are a guacamole fan, you can add even more flavor to this snack. 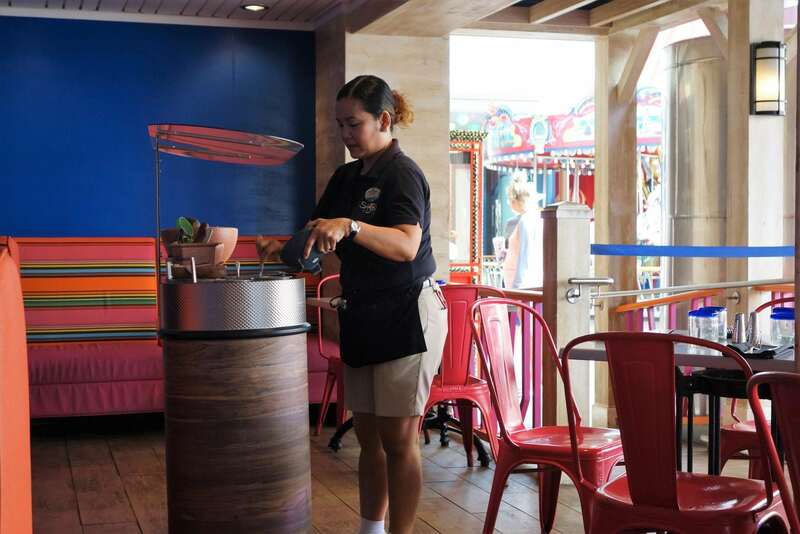 For $6, you can have guacamole made table side- one of the most popular dishes at the restaurant. While I am a fan of guac, the Princess is not, so we passed this time. 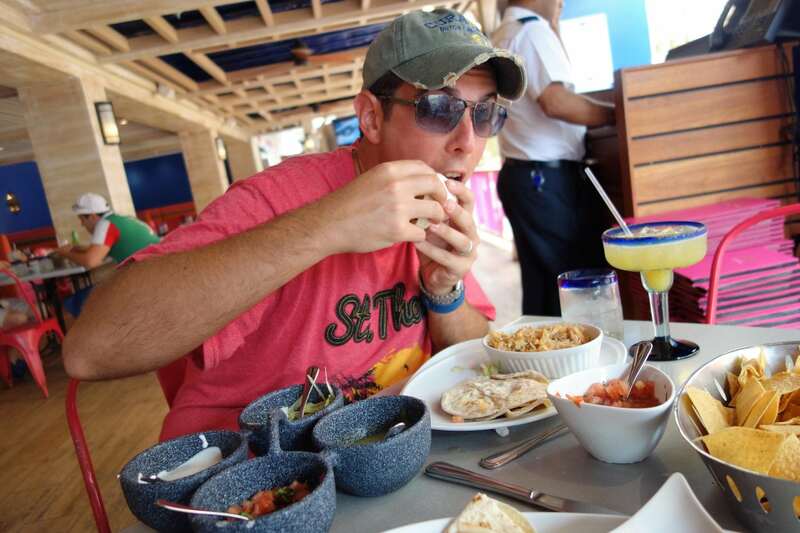 But, we are sure to visit Sabor on Harmony of the Seas, so I might just indulge in some freshly made guacamole then. 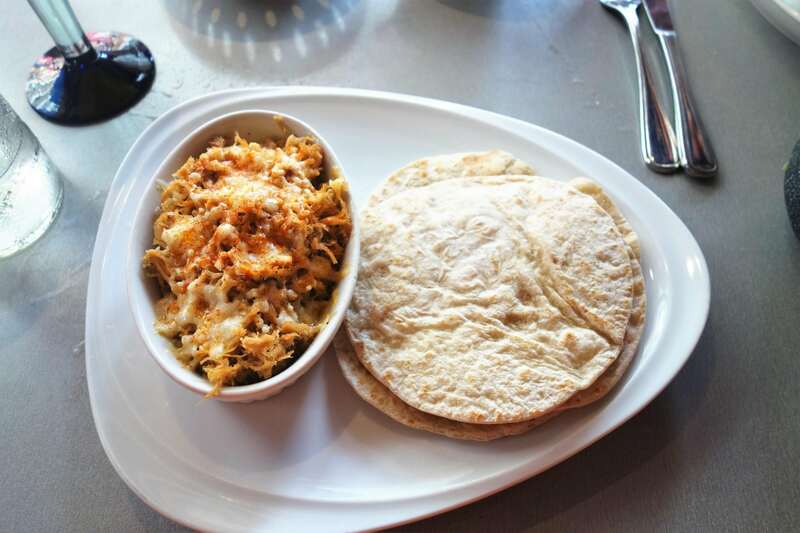 On our first visit to Sabor, the Princess tried the chicken quesadillas, and I ordered tacos, both priced at $6. Her quesadillas were a solid portion for sharing, or as an individual meal. “Very cheesy” was her official review of them. The bacon and scallion flavors were evident in the few bites I tried. I did the Pork Carnita tacos. As titled, you quite literally build your own tacos as they come with the homemade tortillas, and a selection of lettuce, a mild salsa verde, and tomatoes. The pork was a bit salty and dry, but once I added some of the condiments, the complete taco experience was more than satisfying. I would definitely order the tacos again, but perhaps a different filling, like the short ribs. On our second go round, later in our cruise, we each chose a different dish to try. I did the chili calamari for $5. For the price, it was a very large order, much more than I expected. 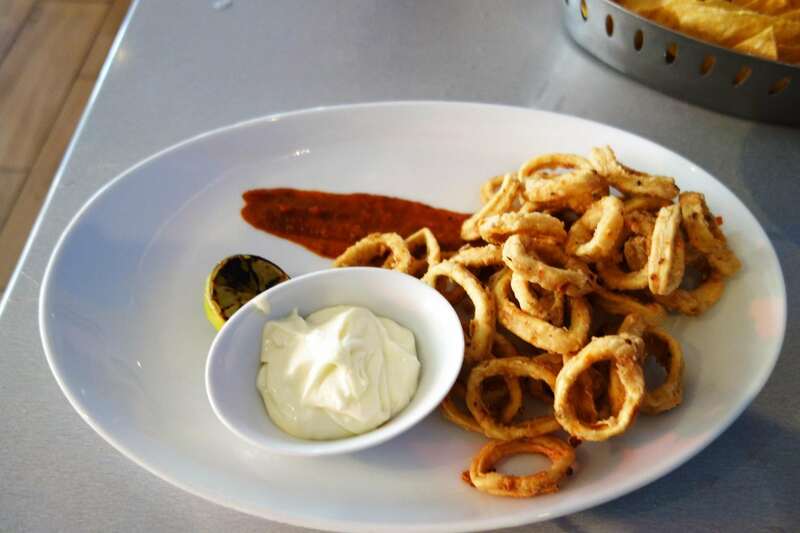 The calamari was crispy and not chewy, and the jalapeno mayo was a nice topping to this meal. This was among some of the best seafood I had all cruise. For her second Sabor taste test, the Princess did the chicken and roasted corn empanada. While this is considered a main course at $10, it was smaller than expected. Don’t get us wrong, the empanadas were quite tasty just not the best value. Perhaps if it is an entree it should come with some sides, or be a little larger? Given that it was a late lunch, we were more than satisfied, but if it were dinner, I would have needed something a bit more substantial. 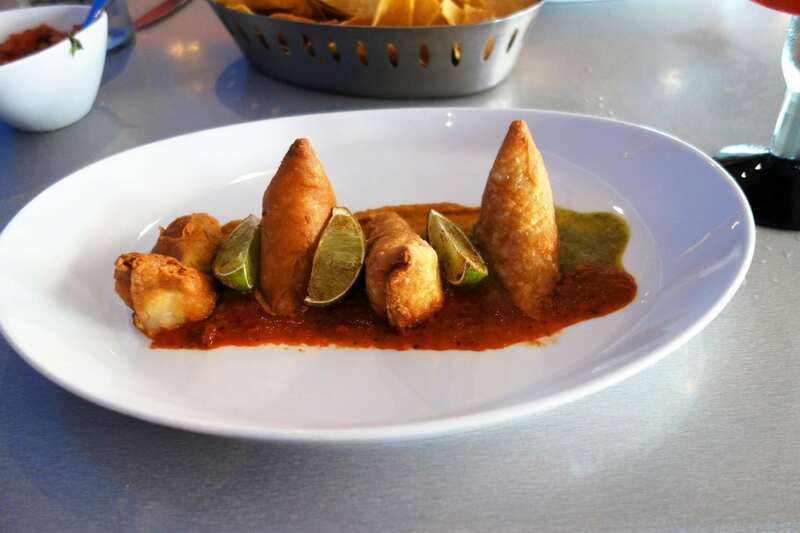 We would definitely visit Sabor again! The drinks and the food exceeded our expectations, and the atmosphere was fun and laid back. Most items at this specialty restaurant were well worth the a la carte pricing, even if one selection was a bit “overpriced”. Even if you don’t want to dine at this venue, you should definitely check it out for the chips/guacamole and handmade margaritas. You’ll be glad you did. 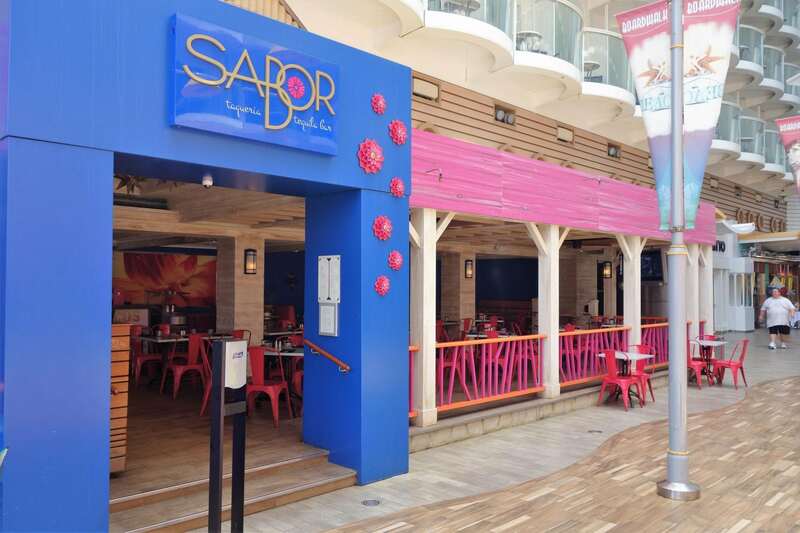 Have you dined at Sabor on a Royal Caribbean cruise ship? What was your favorite thing to eat or drink at this venue? Drop us an anchor below to share your experiences dining at this specialty restaurant.